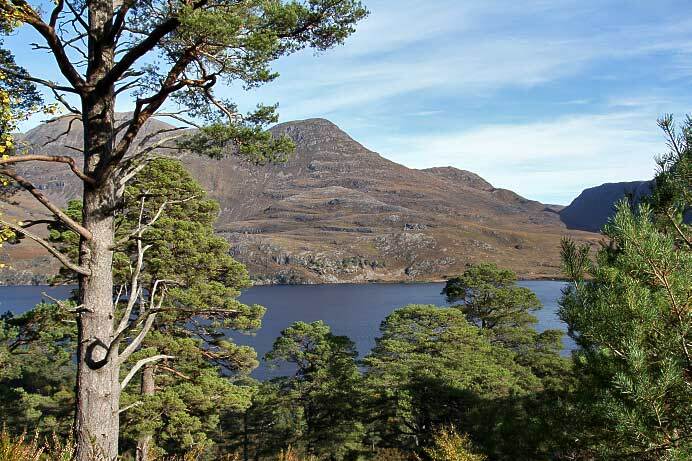 Bordered on one side by the oakwoods of Letterewe Estate and the mountain mass of Slioch, and on the other side by pinewoods of Beinn Eighe Nature Reserve, Loch Maree is regarded as one of the most scenically attractive areas of Scotland. The loch itself is the largest in the north-west Highlands and lies in a glacial trough up to 110m deep. The area has attracted a clutch of conservation accolades which reflect the quality of its habitats, its scenic beauty and the rare plants and animals which are found here. Isle Maol Rubha, Isle Maree, has the remains of a chapel, graveyard, holy well, and holy tree on it, believed to be the 8th century hermitage of Saint Máel Ruba (d. 722), who founded the monastery of Applecross in 672. Isle Maree also attracted the sick and the insane, who drank from its holy well and plunged into the loch three times in the hope of a cure. The same island also contains ancient stands of oak and holly which have been linked with ancient Scottish druids. 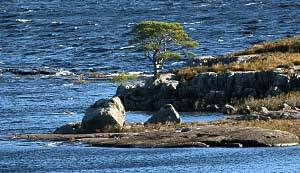 A major feature of the Loch is the large numer of islands which it holds, 66 in total. 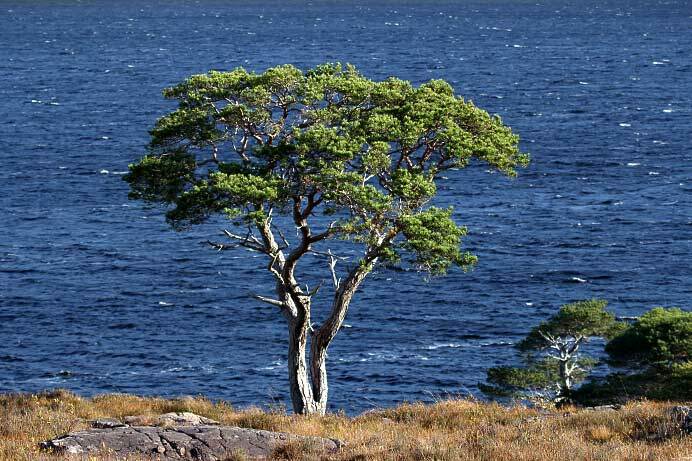 The larger islands such as Eilean Ruaridh Mor, an Garbh Eilean and Eilean Subhainn contain pristine remnants of ancient Caledonian Pinewood. Some of these Scots Pine trees are over 350 years old, and stand on ground which has changed little in the last 8000 years. They are jointly managed as a Natural Nature Reserve by Forest Enterprise, Gairloch Estate and Scottish Natural Heritage, whose aims are to protect and maintain the unique character of this wonderful place in Wester Ross. The Loch is also a very important habitat for the Black-throated diver, a bird of the Siberian forests and Arctic tundra which retains a small breeding population on the western edge of Scotland. 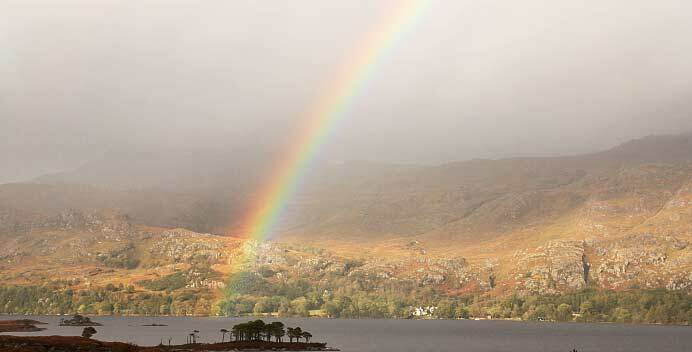 Nearly 6% of British breeding pairs are located at Loch Maree, the largest concentration of this species in the UK. Sea trout and salmon are an important part of Loch Maree’s ecosystem and they provide food for the Black-throated diver and Otter. 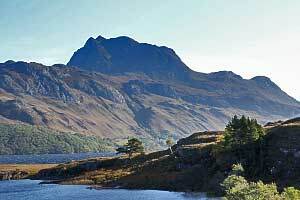 Loch Maree is 20 km long and has a maximum width of 4 km which makes it the fourth largest freshwater loch in Scotland. The A832 from Kinlochewe to Gairloch runs along the shore and there are several places where you can stop and take in the stunning views of the impressive Slioch mountain which casts its reflection over the deep waters. 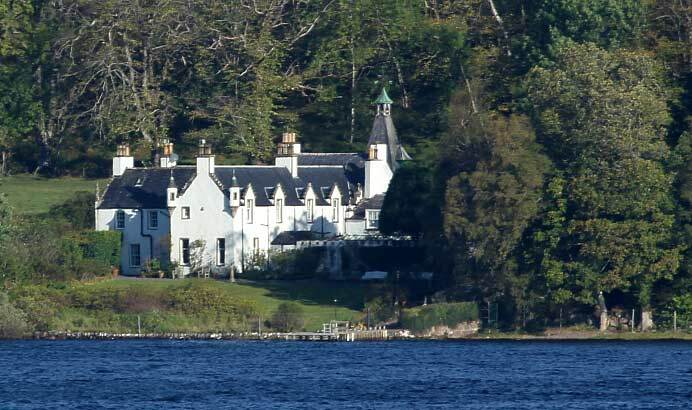 Kayaking is an excellent way to discover the loch and the parking place at Slattadale is perfect to land your kayak in the water. Organised Kayak trips are also possible. There is one walking track next to the loch which is the Tollie path. This walk starts at the Slattadale parking place and ends at Tollie Farm near Poolewe. It’s a one-way track of five miles. Two miles outside Kinlochewe is a parking place with access to the Beinn Eighe Woodland and Mountain Trails.